Yesterday’s service at our church, the Evangelical Church of Bangkok (ECB) was a celebration of the Resurrection. I had the great opportunity to take some photos at the second service, which started at 10am. We had a full house, as you can see in this photo – Pastor David King got me to take this photo from the stage. 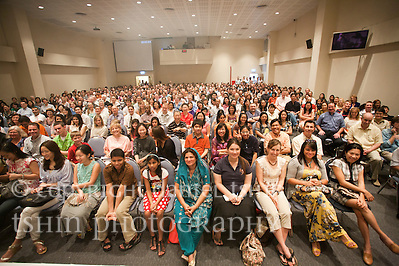 A view of the congregation from the stage at the Evangelical Church of Bangkok (ECB) during the Easter service on 24 April 2011 in Bangkok, Thailand. Easter service was a full house. When doing photo gigs, whether at concerts, weddings, church services and events, photographers usually attest to being wrapped up in elements of taking (or making) photos. This thinking through of any technical details (which is made more difficult if flash photography is involved, not that I know much about it, nevermind mastering it) consumes the photographer – meaning we don’t fully listen in to the message or content. However, there are times when we’re fully engaged in what’s going on without missing a thing. This Sunday started with me being engrossed in photo taking, then realizing I was missing out on the celebration that was going on. I gradually became engaged by the celebration worship and then the photo taking became a backdrop to what was going on. The slide show is below, you can click on the image to download and/or purchase prints. Click through to the photo gallery for those on iDevices or any other mobile devices. This entry was posted on Monday, April 25th, 2011 at 11:24 pm. It is filed under Asia and tagged with Bangkok, church, Easter, ECB, Evangelical Church of Bangkok, photography, service. You can follow any responses to this entry through the RSS 2.0 feed.